Much nicer than I had expected. Very clean and a great value for the price that we paid. Rooms are a bit smaller than average but still very adequate. Very clean place, nice atmosphere, and close to restaurants. It is close to the chinatown area in Paris, so you will find lots of asian food :) . Its is like 30-40 mins away from Eiffel tower, but the subway system works fine, lots of trains round that area. I felt very safe while I was there. I definitely recommend it. The staff were very friendly and helpful. 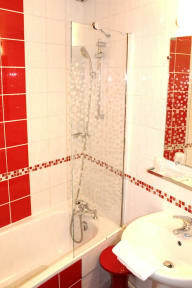 The room was smaller than expected but it was clean and the bathroom was spacious. 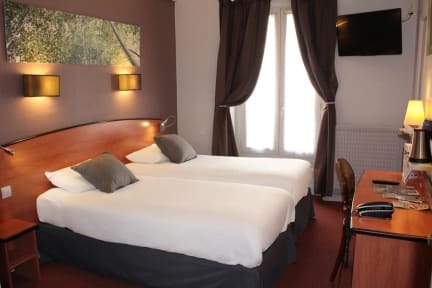 Hotel in great Location close to Place D'Italie and Les Gobbelins Metro stations Fantastic clean room and modern bathroom Only drawback was lack of Air Con. We had the fan on full blast constantly as it was unbelievably warm during this heatwave, especially on the 6th Floor They turned the Fan off when cleaning the room which meant that when we returned it was sweltering Other than that we couldn't fault this hotel and the value for money is superb. Location is easy to get to. Clean, pleasant, well situated. Easy to get to centre monuments though Place d'Italie area itself not very inspiring. I would be happy to use this hotel again. Perfect location and perfect place if you plan to be out all day and only want somewhere to lay your head and wash! It's basic but give you everything you need, clean bed and bathroom. I didn't have much interaction with staff only to check in and out but there was always someone on the desk. I didn't eat here. A little removed from downtown Paris but in a good location near multiple metro lines. Room was small but clean and very nice, though the lights in the hallway were broken. For the price it was a good place to stay.